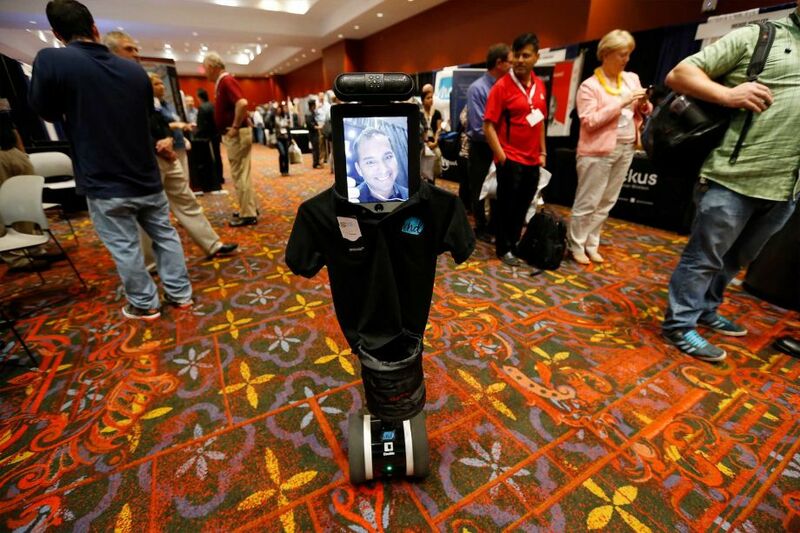 Manuel Oblitas of Visual Net Design of San Antonio is seen on a video display of a Double telepresence robot Thursday while roaming the exhibition hall at the 2015 InnoTech San Antonio conference at the Convention Center. 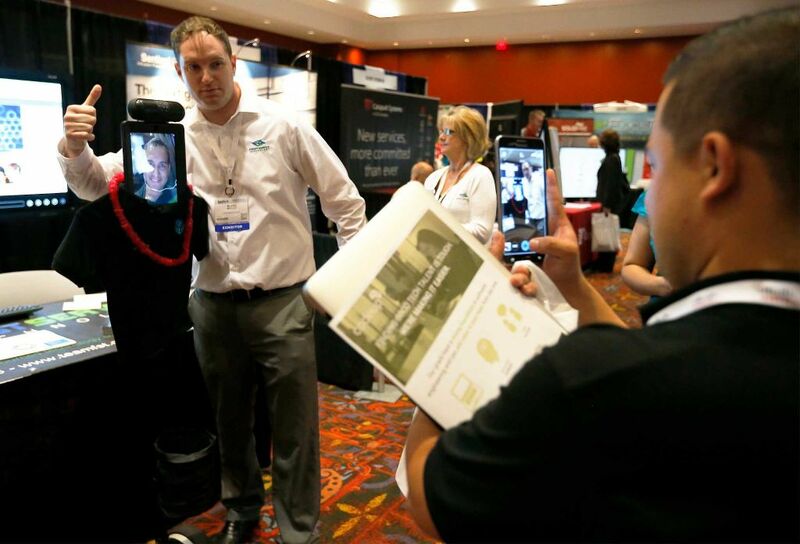 Manuel Oblitas of Visual Net Design is seen on a video display of a Double telepresence robot posing for a picture with exhibitor Blake McCloy of First Service Technology on Thursday in the exhibition hall at the 2015 InnoTech San Antonio conference.The conference hosted about 1,500 attendees with a focus on information technology. Generals of the 24th and 25th Air Force headquartered at Joint Base San Antonio-Lackland AFB said the military is at best catching up to be where it needs to be to keep the nation secure against malicious cyberattacks. To those in uniform, the Internet is as much a domain as air, space, land and sea, Maj. Gen. Burke “Ed” Wilson, commander of the 24th Air Force, said Thursday during a cyber warfare presentation at InnoTech San Antonio, a comprehensive tech conference at the Convention Center. But as a man-made domain that doesn’t have to follow the standard rules of physics, battle plans have to be rethought almost constantly. The 24th and 25th have been quietly growing their San Antonio presence, with the 24th serving as the Air Force’s cyber command and the 25th as the redesignated intelligence, surveillance and reconnaissance agency. Combined with the forces at NSA Texas, they make the city home to the nation’s second-largest asset base for cybersecurity. Wilson said the nature of his mission has allowed him unprecedented fast procurement authority as well as the privilege of cherry-picking some of the brightest of the force. Unlike in the past, cyberspace is now understood as commanders’ business, as opposed to something left to communications or signal officers. “It’s catching up,” he said of military efforts in cyberspace. Some 30,000 active- and reserve-duty service members are currently deployed against cyber threats, and the Air Force is midway through a 1,000-personnel increase in San Antonio. It’s a trend that counters what in general has been a military downsizing. Yet it’s still a challenge keeping up with the insatiable demands of U.S. military operations around the globe, said Maj. Gen. John “Jack” Shanahan of the 25th Air Force. The generals drew a standing-room-only crowd at InnoTech at a time when cyberattacks have affected millions of Americans. Some 1,500 attended the daylong conference, many of them in charge of company information technology departments and grappling with the best ways of safeguarding the brains of their operations. In the case of Muy Brands Chief Information Officer Dan Karam, it’s whether a fast-food franchise operator with 470 restaurants can risk the cost-saving step of outsourcing storage. If the vendor’s server went down during payroll processing, it could mean the lost confidence of 40,000 employees, Karam said during a session on the pros and cons of cloud computing. Karam said it became a matter of trading the convenience of having on-site control of computer systems for the cost savings of not having to have as many technicians on board. Having downtime be someone else’s problem is no real comfort, he said. For William Mundt, director of infrastructure services for University Health System, risks of compromised patient data or high-tech medical equipment mean outsourcing for a lot of the system’s data is not an option. “We definitely keep on site, on the premises,” said. In a round-table discussion on women in tech, four women who found their way to top technology positions talked about the importance of self-confidence in traditionally male-dominated fields. Women should realize that “technology is probably nothing more than an organized approach to solving problems,” said Cynthia Combs, senior vice president of business solutions at USAA. A highlight of the conference was the launch of the “SATecosystem,” an independent tech council to supplement the city’s efforts to promote the local industry. Two San Antonians were honored during the conference. William Phillips, senior vice president and chief information officer of University Health System, was named IT executive of the year. The lifetime achievement award went to David Monroe, CEO and president of the Telesis Group and CEO and president of e-Watch Corp., companies focused on high-tech and intellectual property in the security, surveillance and communications fields. One of the most popular attendees at the conference? Visual Net Design’s Double telepresence robot, which roamed the exhibition hall with the live image of VND Managing Partner Manuel Oblitas on the face screen. It was a novel way for VND, a local Web design company with about 20 employees, to stand out in the crowd and get ideas, said Ruben Robles, who works on VND’s business development.